Public opening and reception: Thursday 6 February at 3 PM. Talk by Doug Lewis Wednesday 12 February at NOON. Talk by Eric Cameron Thursday 13 February at NOON. Talk by Cliff Eyland Wednesday 26 February at 7 PM. 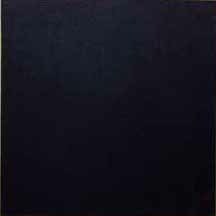 ABOVE: Jeffrey Spalding's Red/Cyan Blue, 150 Coats of Transparent Paint, Spring 1974 acrylic on canvas 17-7/8 x 17-3/4 x 1-1/2 inches. Collection: Gerald Ferguson. Photograph by Bob Talbot, courtesy Jeffrey Spalding. Newton's Prism: Layer Painting includes work by: Jeffrey Spalding, Gerald Ferguson, Paul Hess, Eric Cameron, Mary Scott, John Armstrong, Angela Inglis, Craig Love, Doug Lewis, and Chris Dorosz. The story of layer painting begins in Canada within the 1970s circle of artists at the Nova Scotia College of Art & Design. Layer painting was a species of process art that resulted abstract, often monochromatic works by Jeffrey Spalding (credited by many as the first "layer painter"), Garry Neill Kennedy, Paul Hess, Mary Scott and Bruce Campbell; layers were added or subtracted as in industrial procedure. 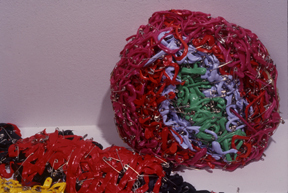 ABOVE: A Mary Scott work entitled In me more you than me Mary In you more me than me Mary, 1999, acrylic paint, safety pins, various dimensions (each roughly 16x4x4 inches. This work is not in the exhibition. Scott's recent practice entails using older works to make new works.) Photograph courtesy Mary Scott. In the 1980s and 1990s iconic content began to crowd out and de-emphasize the painting process in layer painting in favor of charged imagery. Aganetha Dyck's work, in which bees are used to layer objects, more recent Jeffrey Spalding paintings, Germaine Koh's ongoing self-portrait (in which she paints a completely new self-portrait over the last one) and John Armstrong's thickly encrusted works all move away from the strict methodology of process art toward an art of representational imagery. However, other layer painters like Monica Tap, who makes works in which an overhead projector is used to build up layers of paint (click here to see some reproductions of Monica Tap's 'layer' paintings), Chris Dorosz, Doug Lewis, Craig Love (Love means to evoke the mental state of Alzheimer's in his tile paintings and paint peelings), and Angela Inglis (whose work resembles the cross-sections of an archeological dig or a landfill site) all make work that once again results, like the 1970s painters, in completely abstract art. Work by these younger artists might be seen either as a revival or a continuation of process art. 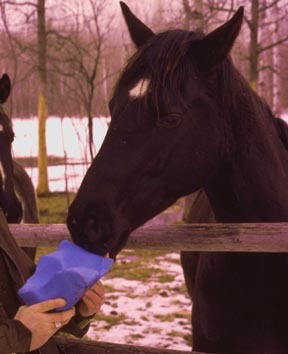 ABOVE: Doug Lewis and salt block-licking horse. Gallery One One One acknowledges generous support by The Canada Council for the Arts, The Manitoba Arts Council, SOFA faculty, staff and volunteers.